As soon as the run starts it creates time-dependent NetCDF files ts_g20km_10ka.nc and ex_g20km_10ka.nc. The latter file, which has spatially-dependent fields at each time, is created after the first 100 model years, a few wall clock seconds in this case. The command -extra_file ex_g20km_10ka.nc -extra_times -10000:100:0 adds a spatially-dependent “frame” at model times -9900, -9800, …, 0. We see that ex_g20km_10ka.nc contains growing “movies” of the fields chosen by the -extra_vars option. A frame of the ice thickness field thk is shown in Fig. 2 (left). 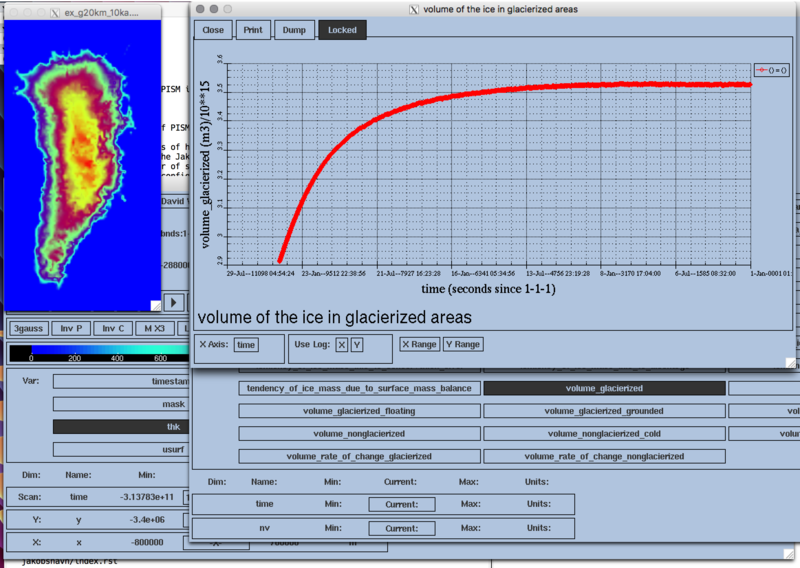 The growing time series for ice_volume_glacierized is shown in Fig. 2 (right). Recall that our intention was to generate a minimal model of the Greenland ice sheet in approximate steady-state with a steady (constant-in-time) climate. The measurable steadiness of the ice_volume_glacierized time series is a possible standard for steady state (see , for exampe). Fig. 2 Two views produced by ncview during a PISM model run. thk, the ice sheet thickness, a space-dependent field, from file ex_g20km_10ka.nc. ice_volume_glacierized, the total ice sheet volume time-series, from file ts_g20km_10ka.nc. Fig. 3 Fields from output file g20km_10ka.nc. usurf, the ice sheet surface elevation in meters. velsurf_mag, the surface speed in meters/year, including the 100 m/year contour (solid black). mask, with 0 = ice-free land, 2 = grounded ice, 4 = ice-free ocean.